This was our best PIT project to date. We had many local visitors, including an archaeology club from a local middle school that came out and helped for a day. Two local newspapers and one local television station covered the project. Because of a series of problems, including rain-damaged roads, difficult access, and rattlesnakes, work that was originally scheduled for spring 2001 on the “Trashed McCardle site” instead took place on the Warrior Fountain site (22FO896). 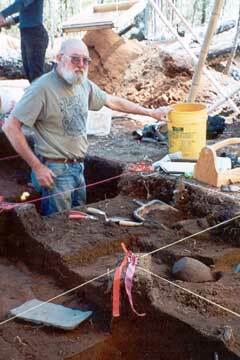 Wayne McCardle located the Warrior Fountain site near Granny Bound Cemetery in 1994, discovering artifacts in a plowed furrow above a spring. Gary Lott and Wayne McCardle revisited the site and dug more than 25 shovel tests to determine its limits. The artifacts found dated between the Early Archaic and the Late Woodland periods (6500 B.C.–A.D. 900). Throughout the two weeks of the fieldwork with the PIT volunteers, we excavated 34 1-m2 units. Both weeks, we concentrated on the edge of the terrace ridge overlooking the spring. Most of the units were excavated to a depth of 70 cm. We had over 350 bags of artifacts. The volunteers found well over 100 projectile points and many pottery sherds. “Woo-hoo” was heard after every find. The projectile points ranged in date from Transitional Paleoindian to Middle Mississippian (7500 B.C.–A.D. 1100), whereas the pottery dated between Middle and Late Woodland (100 B.C.–A.D. 900). 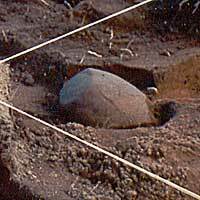 On the last day of the fieldwork, Mary Kreitzer, from Milwaukee, Wisconsin, discovered an intact pottery vessel. Her husband, Art, and Walter Kluge, from Brevard, North Carolina, helped excavate it. The vessel (only the bottom half was intact) was removed with all of its surrounding soil and placed in a bucket to be taken to the lab. During the week of lab work, everybody wanted to help separate the pot from the soil. Unfortunately, it broke during the separation, but several volunteers took it upon themselves to piece it back together. 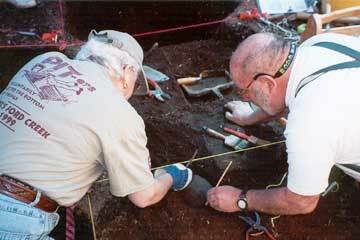 By the second day, they had finished and were starting on sherds from another sherd scatter. Everybody else worked on analyzing, washing, labeling, and illustrating the artifacts. Barbara Houck, from Seal Beach, California, input data into the computer. About half of the artifacts have been analyzed. The volunteers did a great job. In fact, a couple of the local ones asked if they could come up and help with the lab work even if there wasn’t a PIT project going on. Help is always welcomed! For now, the analysis continues.